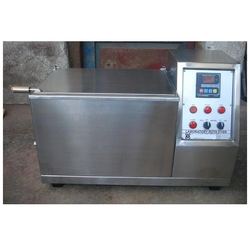 We are manufacturer and supplier of Dyeing Machines to our clients, came with excellent features. Functioning includes process control at each step of the process. It measure temperature of solution inside the beakers. We are instrumental in offering a wide gamut of Rota Beaker Dyeing Machine to our patrons. Offered range can be availed from us invariant models like digital microprocessor-based DP-07 temperature controller & timer that rings buzzer after completion of time frame. These machines are manufactured using high-grade raw material that is sourced from the most accredited vendors of the market.